An exercise calorie counter can come in handy. Ever wonder what type of exercise you'll need to do and for how long to erase that treat you just ate? Unwanted calories can be erased with exercise. The more we move, the more calories we burn. It is one of the best ways to balance out the day when it comes to maintaining your weight or striving for weight loss. Of course we not only exercise to burn calories, but we also exercise to stay fit and healthy, so it's a win win situation all around. An exercise calorie counter will never be 100% accurate as there are so many variables involved, but we can get a pretty good idea of what we need to do to achieve our goals. Of course the type of exercise we choose, the duration, intensity level, along with our weight and gender all play a part in the final calculation. Let's start off with some fun and easy ways to burn calories. The following are based on a person of female gender weighing 150 pounds. (All calculations give an approximately value to the activity mentioned). Something as simple as chewing gum can actually burn about 10 calories every 10 minutes. Not bad for an activity that taste good and involves no effort. Whether you take a walk on your lunch break or around your neighborhood, a 20 minute walk could burn about 100 calories. Avoiding elevators not only helps keep your legs strong, but can burn up to 10 calories per minute. Don't hold back, giggle, chuckle or laugh out loud. This will not only make you feel happy, but can burn 1 calorie a minute. If you enjoy working outside such as doing gardening, weeding or cutting the grass you can burn as much as 110 calories in 25 minutes by doing the activities you love in the fresh air. 6. Do You Enjoy Cooking? All the effort that goes into preparing a meal burns calories too. Washing, peeling, chopping and stirring can burn about 100 calories in about 45 minutes. Spices such as hot peppers and cayenne pepper help speed up your metabolism which helps burn a few more calories. We studied 5 different calorie charts and they all seem to come from reliable sources such as the Department of Health to the Harvard Medical School. But none the less each source gives a different number of calories burned for the same activity listed. So we have taken the most reliable sources and averaged the amounts in the chart below, hoping to give a little more accurate reading. 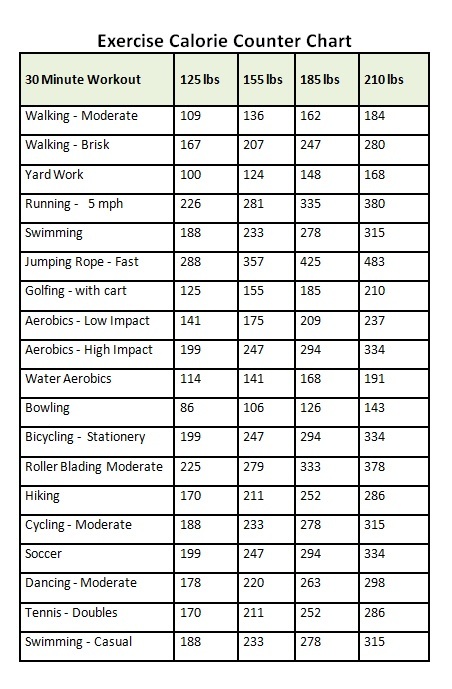 The chart below shows the calories burned for a 30 minute workout for several types of exercises in 4 weight categories. Is there an activity not listed that you need the calories for? Click here for this handy calorie counter to give you more choices. Of course we all know the true success for weight loss. According to the Mayo Clinic 3,500 calories equals about 1 pound of fat. Therefore, you need to burn 3,500 calories more than you take in to lose 1 pound. You can cut 500 calories from your diet each day (500 calories X 7 days equals 3,500 calories) will achieve 1 pound of weight loss in that week or you can exercise like crazy. The bottom line is that a person must burn more calories than they consume to lose weight. One of the best ways to achieve weight loss is by incorporating both. Cut back on calories and exercise 30 minutes each day. 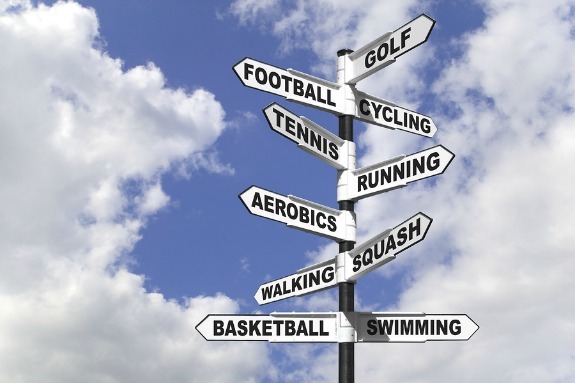 Pick an activity that you enjoy. Take a brisk walk, go for a bike ride or get outside and enjoy a little gardening, whatever the activity you choose try to do 30 minutes of exercise daily. You will be amazed at how the results start building in your favor. Wishing you health and happiness as always.